Visiting Quora is striking because it seems to be one of the rare places on the Internet where a diverse group of people come out of the woodwork to try to be smart and thoughtful. That just doesn’t happen very often. But then, it can be easy to forget to visit Quora, with its random jumble of writings on topics that are interesting but not crucial. As Quora’s co-founder, CEO and also a significant investor, Adam D’Angelo is the driving force behind the site as it expands from Q&A to other kinds of writing. 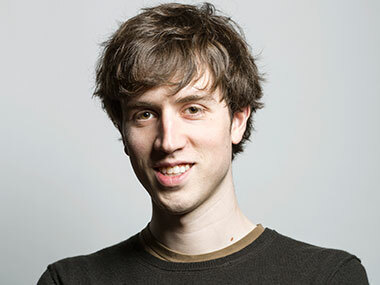 In an interview last week at the company’s new Mountain View, Calif., headquarters, the former Facebook CTO downplayed concerns about the revenue-free Quora growing too slowly, saying he believes he can outlast the faddish companies that come and go by building a high-quality product. Why harp on growth? Despite D’Angelo’s roots at Facebook, where the -illions of users now start with a “b,” four-year-old Quora had just 2.9 million global unique visitors in April, up from 2.6 million the year before, according to comScore. But comScore doesn’t count mobile traffic, which D’Angelo said now amounts to a third of Quora usage. Liz Gannes: How would you describe where Quora as a company is now? Adam D’Angelo: We’re about 50 people, and a year ago we were a third of that. We moved to Mountain View. All these startups grew up in Palo Alto — there’s us, there was Flipboard, there was Pinterest, there was Pulse, and most of the other ones went to the city, but we ended up as the only of those startup down here that’s hiring, so it’s been really good for recruiting because it’s different. We’ve become more data-driven. When you’re small, you have to do everything on intuition, but now we’re at the scale where we have a lot of users, so we can run experiments. We have a data team that’s pretty big, actually. No, it’s more about to make decisions about what to build. We’re looking at whether something’s going to be a good investment of resources. When you’re small, you can say, “I use the product myself, and I’m annoyed by these things, so let’s change this.” Now we can say, “Twenty percent of our users have encountered this issue that makes them less engaged or more engaged,” so we can test it. That’s really important, because then you don’t have to centralize the decision making. So it doesn’t all go through me. We look at people who use it. We don’t share the particular numbers, but it’s pretty big, and it’s growing. But are you happy with how big it is? There’s a perception that Quora is not as huge as it could be, or as people hoped it would be. I’m happy with how big it is now, given it’s now, but I want it to be more in the future. I wouldn’t be happy it if stayed where it is now. So you’re saying you like growth. Okay. It seems — and I speak as someone who has been using Quora for a while — that you guys have a bunch of growth initiatives, various things you’re trying to get people to log in more, in a way that looks like you’re trying to goose growth. But maybe people just want to read content without logging in, and that’s okay. It comes back to the data stuff. When we get people to log in, they end up using Quora a lot more, and we can provide a lot better experience for them. We can show them a personalized news feed, we can send them digest emails, and do all this ranking to find some stuff they want to read. There’s a vocal minority that doesn’t want to log in, but most people just log in and have a better experience, long-term. We’re not trying to goose anything. It’s not like we’re about to raise money, and we’re not about to sell the company, so there’s no reason why we would be doing that unless we thought it would be better long-term. How do you think about the long-term value of content itself? Quora seems to be all about the evergreen content, but isn’t there value in near-term, real-time discussions like what goes on over at Reddit or Twitter? Compared to other products, we’re much more long-term. Most of the stuff that people look at on Quora today was not written in the last month. You write something really good, and maybe it’s the definitive answer on the Internet for the next 10 years. Maybe it’s only a year, but not like a tweet, where it’s only relevant for a day or a week. On Quora, it takes time for the content to accumulate, but it just builds and builds. That means growth goes a little bit slower than something like Twitter or these viral apps, but I also think it means we have higher long-term value that we’re going to reach. So we have answers, blogs and now we have reviews. The area we define as what Quora’s good at is long-form text that’s useful over time, and where you care about who wrote the text. Not that you need to be friends with them, just that they’re someone trustworthy. How do people find things on Quora? What’s the balance between search and social and topics? I think it’s a third, a third, a third. Search is bigger than you think. Really? But I don’t even know what to look for on Quora. It’s not like finding a needle in a haystack like on Google, it’s finding a broad area. It’s probably most useful when you want to do something like visit a new place. You reformulated the Quora core mission recently. Tell me about that. Our new mission is to share and grow the world’s knowledge. It’s what we always thought we were doing, but it’s a different way to say it. If you were to say, Quora is a fill-in-the-blank service, what would it be? That’s different from the mission; that’s positioning. I would say it’s a “knowledge-sharing” service. How is Quora different from other companies? We’re data-driven. We really value execution and getting things done. We do things more frequently than other companies; we have a faster cadence. Everyone says that, but I think it’s not as true. We release code 40 times per day. And we have this thing where code, eight minutes after someone finishes writing it, is live on the site. What if Quora weren’t working? Hypothetically, how would you know when to quit? I have a view that things don’t really decline for no reason. Other companies, when that’s happened, it’s because the users didn’t really like the product. Or that they were gaming Facebook, and Facebook shut them down and finally it caught up to them. I don’t think we’re doing any of this gaming stuff. Or maybe if there were competition, but I don’t think there’s competition for what we’re doing. I have a view that if you build something that’s good, and you keep making it better, it lasts. A lot of times, companies will make these major changes that make things worse and that will lead to a decline. So if that were the case, we’d figure out what was happening and we would revert it.